Published on November 16, 2009 in General. 0 Comments Tags: iParty 2.0, t-shirt, volunteer. 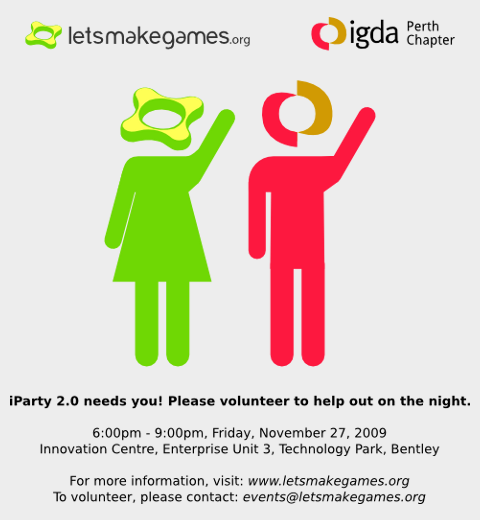 iParty 2.0, the end-of-year party for Perth game developers, is next Friday evening (27 November) and it’s going to be so huge… that we’re looking for volunteers to help ensure that everything runs as smoothly as possible! Make cleaning less of a chore when it’s all over! As an added bonus, if you volunteer by this weekend (Saturday 21 November) – you can get an strictly limited edition iParty 2.0 volunteer t-shirt!